In Verona, Italy, during the Renaissance, two noble families, the Montagues and Capulets, are locked in a bitter feud. After a series of public brawls between both the nobles and the servants of the two families, Prince Escalus, the ruler of Verona, declares that anyone in either family involved in any future fighting will be put to death. Every year the Capulets throw a masquerade ball. The Montagues, of course, are not invited. Capulet and Lady Capulet hope that this year their daughter Juliet will fall in love with Paris at the ball, since at thirteen she will be of marriageable age soon, and Paris would be a good match. But two Montagues, sixteen-year-old Romeo and his cousin Benvolio, along with their friend Mercutio, a kinsmen of Prince Escalus, crash the party. Romeo attends the party only because he wants to see Rosaline, a young woman he has been unsuccessfully pursuing for quite some time. That lack of success has made him noticeably lovelorn of late. But at first sight of Juliet, Romeo falls in love. Juliet is equally smitten. They speak, and kiss. As the party ends Romeo and Juliet separately discover that they belong to rival families, and are both distraught. Yet Romeo is already so in love that instead of leaving the Capulet's residence with his friends, he jumps a wall and hides beneath her balcony. Suddenly she emerges, and tells the night sky about her forbidden love for Romeo. Romeo jumps out from his hiding place. They exchange vows of love. The next day, with the help of Friar Laurence and Juliet's Nurse, Romeo and Juliet are secretly married. That same day, Benvolio and Mercutio encounter Tybalt, who is Juliet's cousin. Tybalt is furious that the Montagues crashed the Capulet party (he spotted them). He has challenged Romeo to a duel. While Mercutio mocks Tybalt, Romeo himself shows up. Tybalt challenged him to fight. Romeo, who is now secretly Tybalt's kinsmen by marriage, refuses. Before Romeo can explain his reasons, Mercutio disgustedly steps in. Romeo tries to separate them, but Tybalt stabs and kills Mercutio under Romeo's arm. Mercutio dies cursing both Montagues and Capulets. In a rage, Romeo kills Tybalt. Because Romeo at first tried to stop the fighting, instead of ordering him executed the Prince banishes him from Verona. Juliet is devastated when she learns that Romeo killed her cousin, but she decides that her loyalty must be with her husband. That night Romeo comes to her room and the lovers are able to spend one glorious night together before Romeo, at dawn, must flee Verona to Mantua. The death of Tybalt affects Lord Capulet deeply. He decides to marry Juliet to Paris immediately. Juliet refuses. Capulet threatens to disown her. Lady Capulet sides with her husband, and even the Nurse advises Juliet to marry Paris and forget Romeo. Juliet rushes to Friar Laurence, who comes up with a plan: he gives her a potion that will make it seem like she's died but will really only put her to sleep. She will be laid to rest in the Capulet tomb, and there will wake up. Meanwhile, the Friar promises to get news to Romeo so that he'll secretly return from Mantua and be there when she wakes up. She follows the Friar's advice. The next morning the Capulet household wakes to discover Juliet has died. Instead of a wedding, they have a funeral. Juliet's body is put in the tomb. But the Friar's letter to Romeo goes astray. Romeo hears only that Juliet has died. In despair, Romeo buys poison and, after fighting and killing a grieving Paris, sneaks into Juliet's tomb. In the tomb, Romeo gazes on what he thinks is the dead body of his beloved, drinks the poison, and dies. Seconds later, Juliet wakes. She sees Romeo's body. Friar Laurence rushes into the cell too late. He tells Juliet what happened, but hears people approaching. He begs Juliet to come with him, but she refuses. He flees. 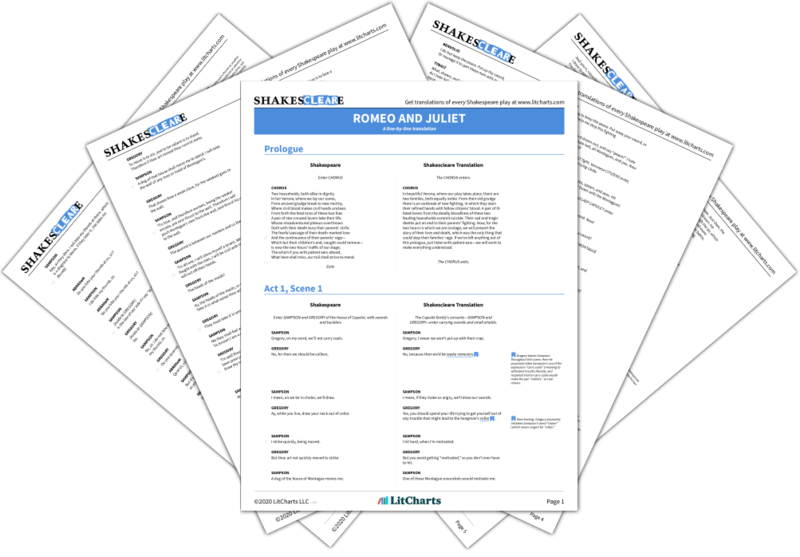 In order to be with Romeo, Juliet kills herself with his dagger. The Montagues and Capulets are grief-stricken when they learn the truth. They agree to end their feud. Florman, Ben. "Romeo and Juliet Plot Summary." LitCharts. LitCharts LLC, 22 Jul 2013. Web. 25 Apr 2019. Florman, Ben. "Romeo and Juliet Plot Summary." LitCharts LLC, July 22, 2013. 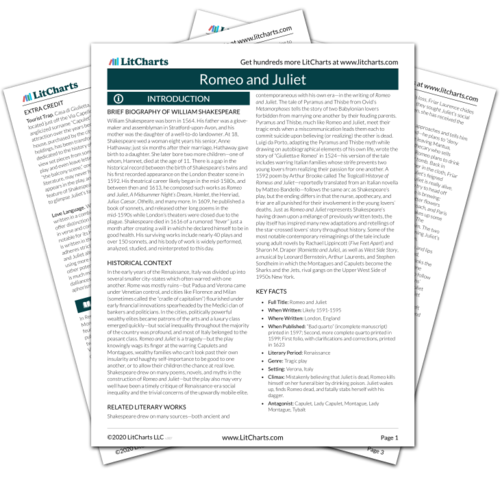 Retrieved April 25, 2019. https://www.litcharts.com/lit/romeo-and-juliet/summary.